The K20 MCU family is pin, peripheral and software compatible with the K10 MCU family and adds full and high-speed USB 2.0 On-The-Go with device charge detect capability. Devices start from 32 KB of flash in 5 x 5 mm 32QFN packages extending up to 1 MB in a 144MAPBGA package with a rich suite of analog, communication, timing and control peripherals. High memory density K20 family devices include a single precision floating point unit and NAND flash controller. Memory and package options for the K20 family. 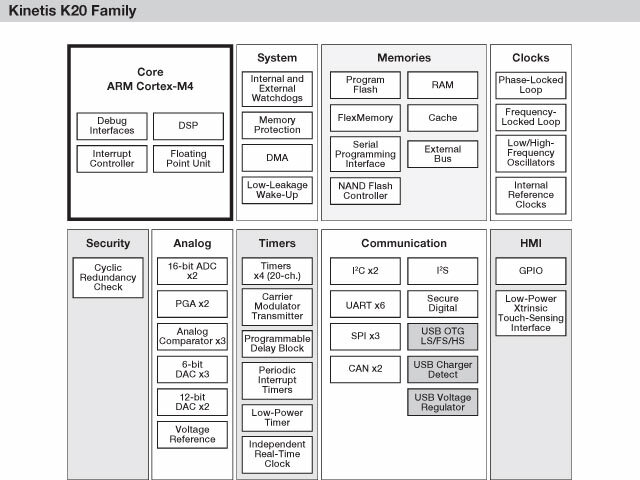 The following table summarizes the memory and package options for the K20 family. All devices which share a common package are pin-for-pin compatible.